punica, Latin punicus, scarlet or red but also referring to the so-called Punic Wars. The Romans called it the Punic apple because it came from Carthage. granatum, from granum, "grain" and means "(multi)grained" (alluding to the many seed grains). pomegranate derives from Latin pomum, ("apple") and granatus, ("grains"). The Hebrew rimmôn, and Arabic rummân derived from the ancient Egyptiam rmn. 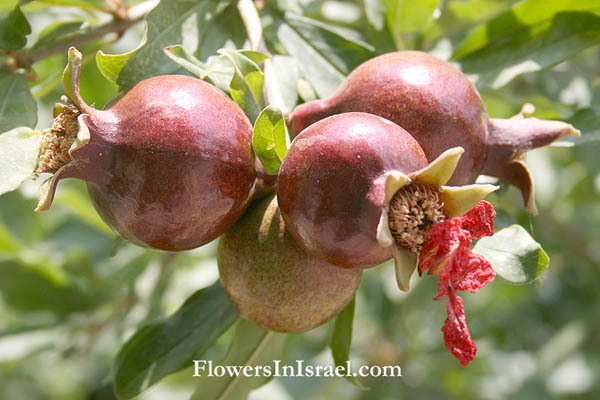 In Hebrew the word rimon (רימון) may mean both "pomegranate fruit" and "shell". In many European languages, the weapon shell has names similar to granate. These derive from the same Latin word granum “grain”, attested in 1532, from the French name for the fruit (pome) grenade. "Granada" is the Spanish word for "pomegranate." And Grenada is an island country lying in close proximity to the Grenadine islands and in the list of exports does not include pomegranates - in fact, pomegranates do not fair their best in tropical climates. Grenadine (grenadine syrup) is a syrup made from pomegranates. The pomegranate is frequently referred to in Semitic literatures, is often represented on Assyrian and Egyptian monuments, and was a religious symbol in many ancient cults. It has a place in Jewish, Christian, Buddhist, Islamic and Pagan traditions alike. 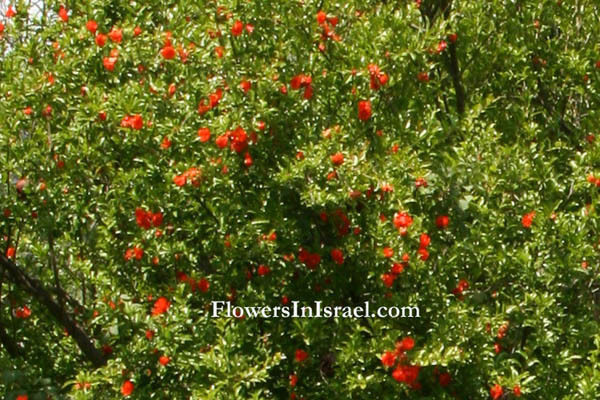 It was one of the common fruit-trees in Israel (Deut. 8:8; Joel 1:12, etc.). Some scholars of antiquity assume that the pomegranate was the tree of life in the Garden of Eden, and according to a number of legends it was the fruit of this tree rather than the apple with which Eve tempted Adam. The two fruits are alike, at least on the outside. In a Homeric Hymn, Persephone, daughter of Ceres, the Goddess of growth and abundance, was forced to spend four months of each year in the underworld, because Pluto forced her to eat the seed of the pomegranate, when she was held captive in the underworld. The period of time in which this would take place is during winter, with spring heralding the return to the world aboveground. Because of its role in the Greek legend of Persephone, the pomegranate came to symbolize fertility, death, and eternity and was an emblem of the Eleusinian Mysteries. 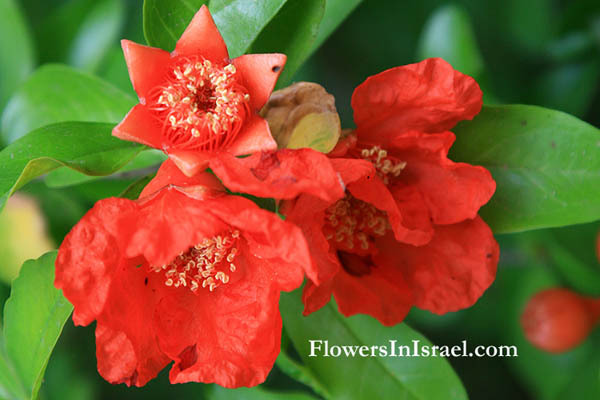 The pomegranate has sometimes been taken as a symbol of fertility, appropiate to the godess who presided over marriage. Karl Bötticher (1806–89), a German archaeologist, interpreted it differently [Archaologische Zeitung, 1856, pp. 169.176]. He pointed out that, from the blood-red appearance of the inside of the fruit, it was associated with ideas of blood and death. It was said to have sprung from the blood of Dionysus. In Greek mythology the Furies / Erinyes planted a pomegranate tree on the grave of the slain Eteocles (king of Thebes, the son of Oedipus); when the fruit was pulled, blood flowed from it. A pomegranate tree grew over the grave of the suicide Meneceus (Pausanias 9.25.1 : On the tomb of Menoeceus grows a pomegranate-tree. If you break through the outer part of the ripe fruit, you will then find the inside like blood. This pomegranate-tree is still flourishing). To dream of pomegranates foreshadowed wounds (Artemidorus, Onirocr. i. 73). Proserpine, after she had been carried off by Pluto to the lower world, would have been allowed to returnm to the upper world if she had not eaten a seed of a pomegranate. In Christianity the Pomegranate is the symbol of the Resurrection of Jesus after its classical association with Persephone (Persephone is the equivalent of the Roman goddess Proserpine, an ancient Roman goddess), a life-death-rebirth deity. The many seeds contained in its tough case made it also a symbol of the unity of the many under one authority, and of chastity. Of the seven species in Deut. 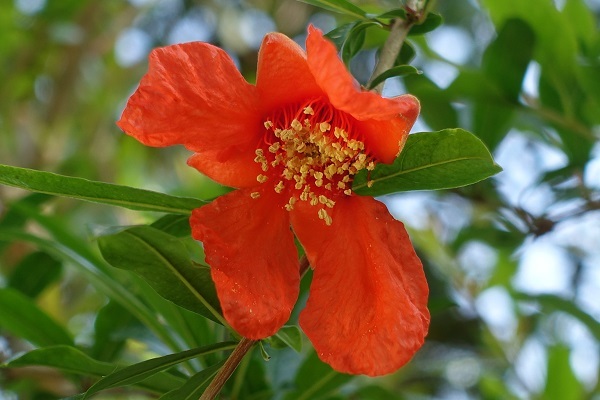 8:8, Punica granatum L. (Punicaceae) may be the most beautiful. Pomegranates figure prominently in three places in Scripture: the garment of the high priest (Exod. 28:33), as a garland on the temple pillars, and in the Song of Songs. Solomon's temple had four hundred pomegranates engraved on the capitals of the two pillars located at the front of the temple (1 Kings 7:42; 2 Chron. 4:13). These pomegranates are also mentioned in Jer. 52:22–23. In Song of Songs 4:3 and 6:7, the red interior of the fruit is likened to the temples of the Beloved. 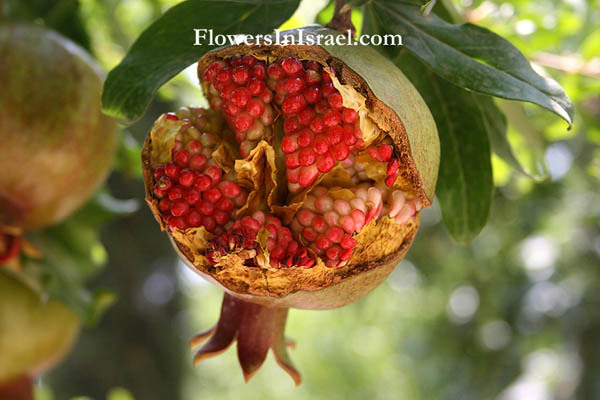 "The network with pomegranates" of the temple of Salomon (I Kings 7:41-2) and the pomegranate on the garments of Aaron (Exodus 28:33-4) were no doubt symbolical. The classical authors mentioned wine made from pomegranate juice, which was according to Dioscorides (ca. 40-ca. 90 CE) used for medicinal purposes and he recorded it as 'to bind the stomach'. Pomegranate may be used in the treatment of dysentry, diarrhoea and stomach-ache. The rind was used to dye the leather yellow (Pliny, N.H.XIII.XXXIV). Claudia Roden's The Book of Jewish Food. Gently fry the duck breasts in oil, skin side down for 5-10 minutes, until they release their fat. Add the onion, garlic and salt and pepper. Fry until onion is soft, stirring occasionally. Once the skin has browned, turn the heat up and brown the flesh side. Remove the duck from the pan and leave in a warm place. Pour the duck fat from the onions and reserve fat for another use. Add the pomegranate molasses, chicken stock, walnuts and a little sugar to taste. Stir well, bring to a simmer then return the duck to the pan. Continue cooking until the duck is medium rare. Rest the duck for 5 minutes while you reduce the liquid to sauce consistency.